The sign outside the Circle K near 54th Street and Chandler Boulevard read two cents a gallon and three for diesel Tuesday night. It was probably one of those things that deserved a second, maybe even a third, glance as you drove by. Or in Krystal Sederstrom's case, it was just one of those things where your husband grabs the wallet, car keys and runs out the door. The sign outside the Circle K near 54th Street and Chandler Boulevard read two cents a gallon and three cents for diesel Tuesday night. Sederstrom said she received a text from a friend about the low gas price. "I was shocked that it was that low," Sederstrom said in an exchange with 12 News in a community Facebook group. She shared a photo of her pump, showing she and her husband Stephen filled up nine gallons for 26 cents. Others filled up too with the low price, Vanessa Mumbuluma shared her husband Matongo's photo showing a pump that filled 14 gallons for .41 cents. Randy Kerr said he didn't believe it when he first saw the posts in the local community Facebook group. He got in his vehicle and actually drove to the wrong Circle K, before realizing his mistake and driving across the freeway to the right location near the Whataburger. "To my surprise, there was actually a couple pumps open. Also at that time, there was (sic.) two pumps closed," Kerr wrote on Facebook to 12 News. 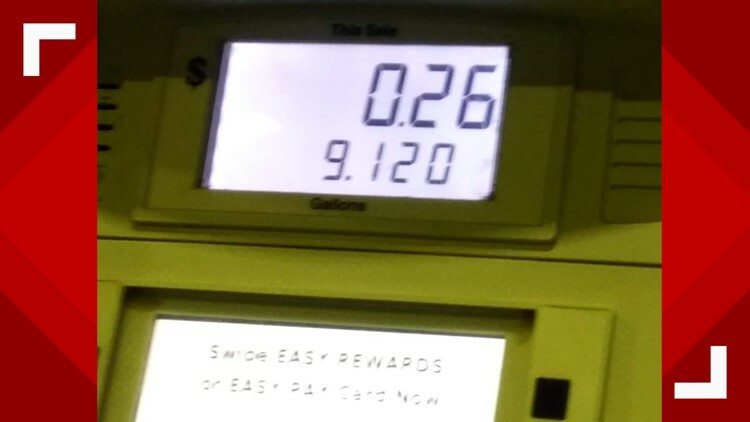 "I pulled up, was completely shocked, and filled up my vehicle." He went back and grabbed his wife's and when he returned four pumps were closed and a line was starting to form at the open pumps. "That second trip it was a bit more crazy," Kerr said. "People were on the phone, calling friends or family members telling them about it. People were taking pictures of the pumps, pictures of the sign out on the street, I saw people taking selfies, taking video, and more people are waiting in line." “I took my picture, started laughing and went home,” he said. 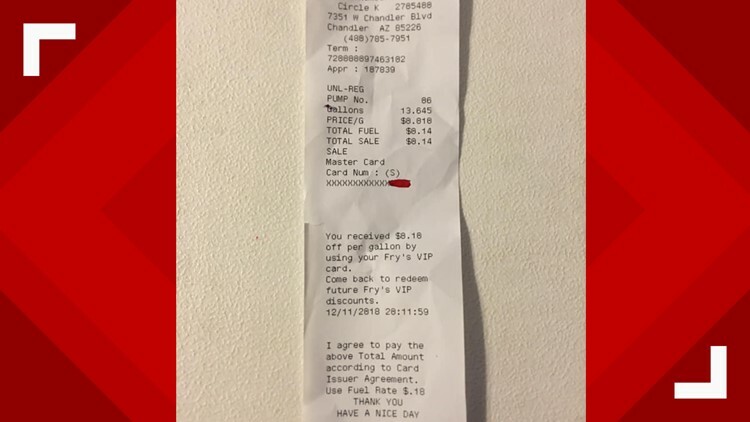 Kerr shared his own photos in the Facebook group, including one of his receipt showing the low charge on his card, 13 gallons for 14 cents after he used a Fry's discount. Others weren’t as lucky as Sederstrom, Mumbuluma or even Kerr. They were stuck in line when the pumps were returned to normal. 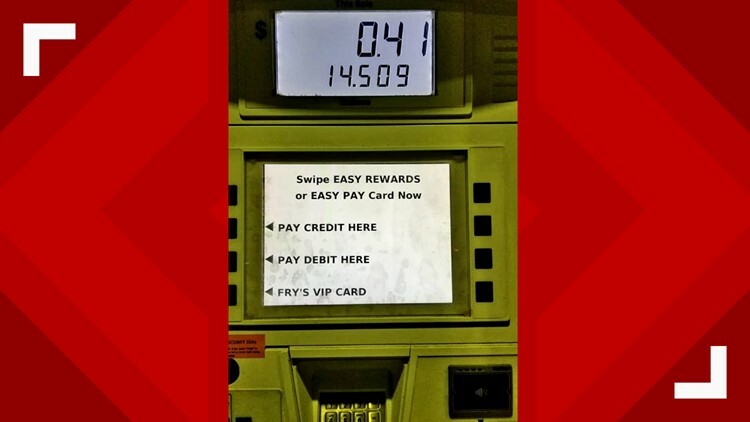 There were some who were happy for those who filled up, while at least a few others questioned the character of those who took advantage of the low price. Kerr responded to some of the negative comments saying no one did anything malicious. “Nobody set out to rob the gas station, nobody was trying to screw over 'the man' on purpose,” Kerr said. Messages left with Circle K’s corporate office were not returned by the time of this posting. “I mean it’s Christmas time, and whether it was a glitch in the system, somebody punched in the wrong number, something got hacked, any amount of savings this time a year is great for people,” Kerr said.